A gifted child grows up in a culture that is materially poor but musically rich. He achieves recognition among his peers; then local success. Finally, after hard work and good luck, he has widespread national (and international) popular acclaim. He becomes a role model for younger musicians and even gets to play in the White House, an inspiring member of the establishment who retains the common touch. 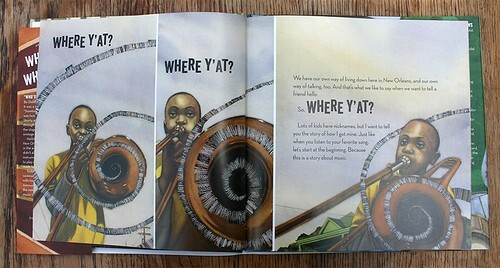 Right, top and below: spreads from Trombone Shorty (Abrams, 2015). All illustrations by Bryan Collier. But what’s different from the stories of, say, Louis Armstrong, or Nile Rodgers is that the protagonist, Troy Andrews, aka Trombone Shorty, is barely out of his twenties. 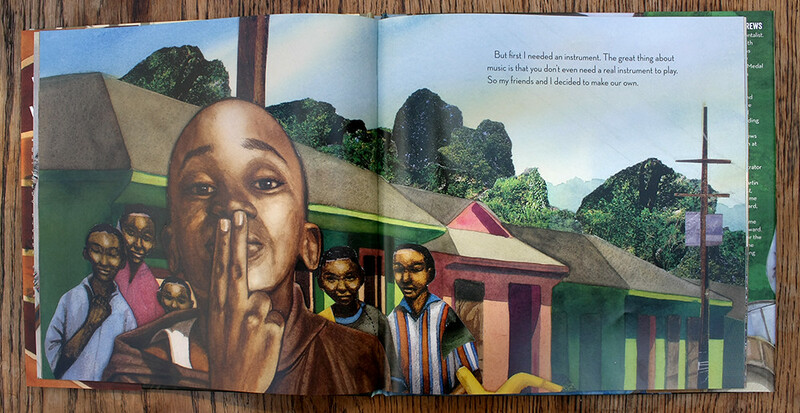 Illustrator Bryan Collier (whose book Uptown depicted Harlem through the eyes of a boy) brings a warm and empathetic eye to the mythic elements of Andrews’ story. 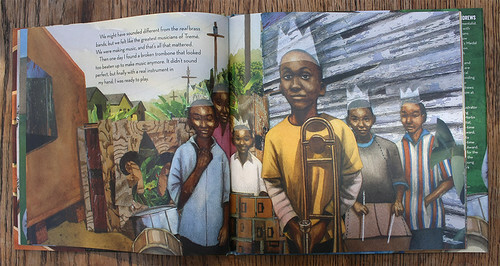 When he draws Andrews’ first band, with their homemade instruments, he adds translucent crowns to represent their innate nobility. Collier adds transparent crowns to his portrayal of the young musicians. Trombone Shorty meets Bo Diddley. Collier’s touch is less sure when he introduces a few photomontage elements into the artwork. 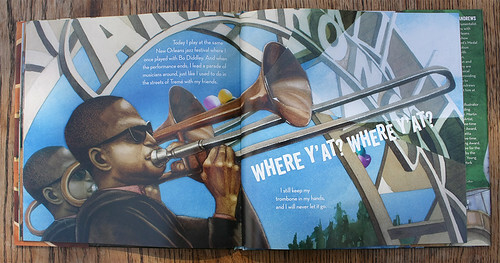 The final pages, a conventional biographical account (with photos) for parents or older children, are enough to show us what Trombone Shorty looks like, man and boy. 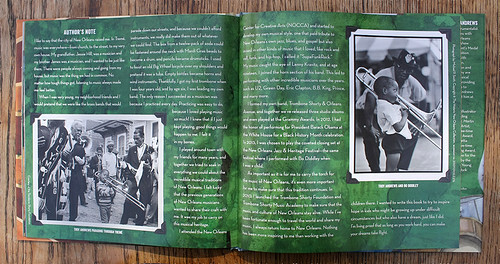 However Collier’s best illustrations evoke the Tremé locations, the aroma of gumbo and most of all, the deep affection that musicians feel for their instruments – not just Andrews but his trumpeter brother James, and the many unnamed bandsmen that populate his pages. A light overlay represents sound coming from the brass instruments’ bells. A picture of the little boy sleeping with his beloved trombone brings to mind the wide-eyed sentiments of James Mollison’s Where Children Sleep (see ‘Show and tell’ in Eye 82). Collier also uses cut-out overlays as a way to represent sounds ringing out from the bells of brass instruments. 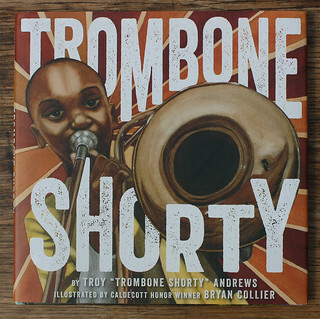 Biography of Trombone Shorty (aka Troy Andrews) with archive photos. No mention is made of Hurricane Katrina, ten years ago this month – the book brims with musical positivity and good vibes. 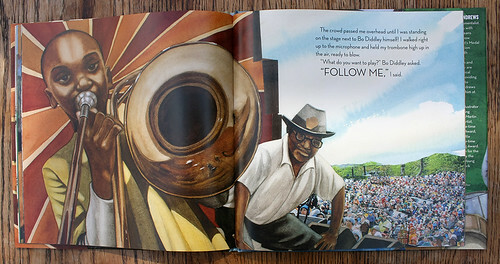 Trombone Shorty is a picturebook that may encourage musically curious youngsters to find out more about New Orleans and its role in the history of jazz.